My scientific interest focuses on interactions between unicellular eukaryotes (protists) and heterotrophic bacteria within aquatic microbial food webs. Principally, we find in this small world any kind of ecological relationship: predation, parasitism, competition, mutualism. The interaction between protists and bacteria is often seen as a classical predator-prey relationship, disregarding the various “side-effects” concerning interspecific competition, shifts in nutrient regeneration, changes in nutrient availability and changing vulnerability to parasites. On the other hand, environmental parameters (e.g., seasonal variations in aquatic systems, eutrophication) have a strong influence on the development of protists-bacteria interactions. My research group studies these diverse relationships in lab-experiments (by chemostat-systems) and field-studies in alpine lakes. My long term goal is to get a holistic view of the huge variety of interactions (from commensalisms to parasitism) between aquatic (cyano)bacteria and unicellular eukaryotes. - Protists feeding on toxic filamentous cyanobacteria. - Symbiotic interactions between bacteria and protists during the degradation of cyanobacterial toxins. - Long-term development of the cyanobacterium Planktothrix rubescens in relation to climate change and oligotrophication. - The surprising rich biodiversity of benthic freshwater ciliates in lakes. Do intermediate disturbances favour species richness? - The seasonality of planktonic ciliates and their importance of phytoplankton spring bloom termination. - Influence of different trophic conditions, mimicked in chemostats and field experiments, on the development of bacterial grazing-defense mechanisms. - February 2003:FEMS-Workshop “Assessing the Variability in Aquatic Microbial Populations: Facts and Fiction”. Mondsee, Austria. In cooperation with Jens Boenigk (Mondsee, Austria). 65 participants from 9 countries.Protists feeding on toxic filamentous cyanobacteria. - March 2004: 23th Annual meeting of the German Society for Protozoology. Innsbruck, Austria. In cooperation with Bettina Sonntag. 130 participants from 5 countries. - January 2009: SME2009 – Meeting of the Swiss Microbial Ecology group, Einsiedeln, Switzerland. 100 participants. - March 2013: 32nd Annual meeting of the German Society for Protozoology. Kartause Ittingen, Switzerland. 110 participants from 10 countries. - Engaged in teaching since 1995. First as a co-lecturer, own lectures and courses since 1998. Up to now, 60 lectures and courses were held. Topics of teaching: general and specialized protistology, general limnology, aquatic microbial ecology, and symbiotic interactions between prokaryotes and unicellular eukaryotes. - Supervisor of 11 Diploma (master) and 4 Doctorate (PhD) students. Theses were written in English, and most results were published by the students in peer-reviewed journals. •	Review editor for Aquatic Microbial Ecology. •	Review activities for numerous journals (e.g. Microbial Ecology, Environmental Microbiology, Limnology & Oceanography, Journal of Plankton Research, Archiv für Hydrobiologie, etc.). •	Member of the DGP (Deutsche Gesellschaft für Protozoologie) and the ASLO (Advancing the Science of Limnology and Oceanography). 1993 - 1995 Master thesis at the Institute of Limnology (Austrian Academy of Sciences, Mondsee). Title: Uptake of fine-particulate detrital particles by ciliates. Supervisor: Univ. Prof. Hartmut Arndt. 1988 - 1995 Study of Zoology and Limnology at the University of Innsbruck. Pitsch, G., Bruni, E.P., Forster, D., Qu, Z., Sonntag, B., Stoeck, T., and Posch, T. (2019). Seasonality of Planktonic Freshwater Ciliates: Are Analyses Based on V9 Regions of the 18S rRNA Gene Correlated With Morphospecies Counts? Frontiers in Microbiology 10:248. doi: 10.3389/fmicb.2019.00248. Pitsch, G., Adamec, L., Dirren, S., Nitsche, F., Šimek, K., Sirová, D., and Posch, T. (2017). The Green Tetrahymena utriculariae n. sp. (Ciliophora, Oligohymenophorea) with its Endosymbiotic Algae (Micractinium sp. ), Living in Traps of a Carnivorous Aquatic Plant. J Eukaryot Microbiol, 64:322-335. doi: 10.1111/jeu.12369. Yankova, Y., Neuenschwander, S., Köster, O., and Posch, T. (2017). Abrupt stop of deep water turnover with lake warming: Drastic consequences for algal primary producers. Nature Scientific Reports 7, 13770. Šimek, K., Pitsch, G., Salcher, M.M., Sirová, D., Shabarová, T., Adamec, L., and Posch, T. (2017). Ecological Traits of the Algae-Bearing Tetrahymena utriculariae (Ciliophora) from Traps of the Aquatic Carnivorous Plant Utricularia reflexa. J. Eukaryot. Microbiol., 64:336-348. doi: 10.1111/jeu.12368. Salcher, M.M, Neuenschwander, S.M., Posch, T., and Pernthaler, J. (2015). The ecology of pelagic freshwater methylotrophs assessed by a high-resolution monitoring and isolation campaign. ISME Journal 9: 2442-2453. Derlon, N., Koch, N., Eugster, B., Posch, T., Pernthaler, J., Pronk, W., and Morgenroth, E. (2013). Activity of metazoa governs biofilm structure formation and enhances permeate flux during Gravity-Driven Membrane (GDM) filtration. Water Res 47, 2085-2095. Garneau, M-E., Posch, T., Hitz, G., Pomerleau, F., Pradalier, C., Siegwart, R., and Pernthaler, J. (2013) Short-term displacement of Planktothrix rubescens (cyanobacteria) in a pre-alpine lake observed using an autonomous sampling platform. Limnol Oceanogr 58, 1892–1906. Pomati, F., Kraft, N.J.B., Posch, T., Eugster, B., Jokela, J., and Ibelings, B.W. (2013). Individual cell based traits obtained by scanning flow-cytometry show selection by biotic and abiotic environmental factors during a phytoplankton spring bloom. PLOS ONE 8 (8), 1-11. Hitz, G., Pomerleau, F., Garneau, M.E., Pradalier, C., Posch, T., Pernthaler, J., and Siegwart, R.Y. (2012) Autonomous Inland Water Monitoring. Design and Application of a Surface Vessel. IEEE Robotics & Automation Magazine 19(1), 62-72. Horňák, K., Zeder, M., Blom, J. F., Posch, T., and Pernthaler, J. (2012). Suboptimal light conditions negatively affect the heterotrophy of Planktothrix rubescens but are beneficial for accompanying Limnohabitans spp. Environ Microbiol 14, 765-778. Salcher, M.M., Pernthaler J., Frater N., Posch T. (2011). Vertical and longitudinal distribution patterns of differnt bacterioplankton populations in a canyon-shaped, deep prealpine lake. Limnol Oceanogr 56:2027-2039. Salcher, M.M., Pernthaler, J., Posch, T. (2011). Seasonal bloom dynamics and ecophysiology of the freshwater sister clade of SAR11 bacteria 'that rule the waves' (LD12). ISMEJ 5:1242-1252. Van den Wyngaert, S., Salcher, M.M., Pernthaler, J., Zeder, M., and Posch, T. (2011). Quantitative dominance of seasonally persistent filamentous cyanobacteria (Planktothrix rubescens) in the microbial assemblages of a temperate lake. Limnology and Oceanography 56, 97-109. Salcher, M.M., Pernthaler, J., and Posch, T. (2010). Spatiotemporal distribution and activity patterns of bacteria from three phylogenetic groups in an oligomesotrophic lake. Limnology and Oceanography 55, 846-856. Posch, T., Franzoi, J., Prader, M., and Salcher, M.M. (2009). New image analysis tool to study biomass and morphotypes of three major bacterioplankton groups in an alpine lake. Aquatic Microbial Ecology 54, 113-126. Salcher, M.M., Pernthaler, J., Zeder, M., Psenner, R., and Posch, T. (2008). Spatio-temporal niche separation of planktonic Betaproteobacteria in an oligo-mesotrophic lake. Environmental Microbiology 10, 2074-2086. Posch, T., Mindl, B., Hornak, K., Jezbera, J., Salcher, M.M., Sattler, B., Sonntag, B., Vrba, J., and Simek, K. (2007). Biomass reallocation within freshwater bacterioplankton induced by manipulating phosphorus availability and grazing. Aquatic Microbial Ecology 49, 223-232. Salcher, M.M., Hofer, J., Hornak, K., Jezbera, J., Sonntag, B., Vrba, J., Simek, K., and Posch, T. (2007). Modulation of microbial predator-prey dynamics by phosphorus availability: Growth patterns and survival strategies of bacterial phylogenetic clades. Fems Microbiology Ecology 60, 40-50. Sonntag, B., Posch, T., Klammer, S., Teubner, K., and Psenner, R. (2006). Phagotrophic ciliates and flagellates in an oligotrophic, deep, alpine lake: contrasting variability with seasons and depths. Aquatic Microbial Ecology 43, 193-207. Mindl, B., Sonntag, B., Pernthaler, J., Vrba, J., Psenner, R., and Posch, T. (2005). Effects of phosphorus loading on interactions of algae and bacteria: reinvestigation of the 'phytoplankton-bacteria paradox' in a continuous cultivation system. Aquatic Microbial Ecology 38, 203-213. Salcher, M.M., Pernthaler, J., Psenner, R., and Posch, T. (2005). Succession of bacterial grazing defense mechanisms against protistan predators in an experimental microbial community. Aquatic Microbial Ecology 38, 215-229. Pfandl, K., Posch, T., and Boenigk, J. (2004). Unexpected effects of prey dimensions and morphologies on the size selective feeding by two bacterivorous flagellates (Ochromonas sp and Spumella sp.). Journal of Eukaryotic Microbiology 51, 626-633. Sekar, R., Pernthaler, A., Pernthaler, J., Warnecke, F., Posch, T., and Amann, R. (2003). An improved protocol for quantification of freshwater Actinobacteria by fluorescence in situ hybridization. Applied and Environmental Microbiology 69, 2928-2935. Simek, K., Nedoma, J., Pernthaler, J., Posch, T., and Dolan, J.R. (2002). Altering the balance between bacterial production and protistan bacterivory triggers shifts in freshwater bacterial community composition. 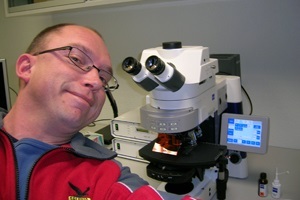 Antonie Van Leeuwenhoek International Journal of General and Molecular Microbiology 81, 453-463. Andreatta, S., Wallinger, M.M., Posch, T., and Psenner, R. (2001). Detection of subgroups from flow cytometry measurements of heterotrophic bacterioplankton by image analysis. Cytometry 44, 218-225. Pernthaler, J., Posch, T., Simek, K., Vrba, J., Pernthaler, A., Glockner, F.O., Nubel, U., Psenner, R., and Amann, R. (2001). Predator-specific enrichment of actinobacteria from a cosmopolitan freshwater clade in mixed continuous culture. Applied and Environmental Microbiology 67, 2145-2155. Posch, T., Jezbera, J., Vrba, J., Simek, K., Pernthaler, J., Andreatta, S., and Sonntag, B. (2001). Size selective feeding in Cyclidium glaucoma (Ciliophora, Scuticociliatida) and its effects on bacterial community structure: A study from a continuous cultivation system. Microbial Ecology 42, 217-227. Posch, T., Loferer-Krossbacher, M., Gao, G., Alfreider, A., Pernthaler, J., and Psenner, R. (2001). Precision of bacterioplankton biomass determination: a comparison of two fluorescent dyes, and of allometric and linear volume-to-carbon conversion factors. Aquatic Microbial Ecology 25, 55-63. Andreatta, S., Wallinger, M.M., Posch, T., and Psenner, R. (2000). Flow cytometry of aquatic heterotrophic bacteria: Detection and sorting of functional subgroups for ecological studies. Cytometry Supplement, 85. Sonntag, B., Posch, T., and Psenner, R. (2000). Comparison of three methods for determining flagellate abundance, cell size, and biovolume in cultures and natural freshwater samples. Archiv Fur Hydrobiologie 149, 337-351. Wallinger, M.M., Andreatta, S., Posch, T., and Psenner, R. (2000). Flow and image cytometric analysis of protozoan grazing pressure on a bacterial community in a two-stage flow-through system (chemostat). Cytometry Supplement, 77. Pfister, G., Sonntag, B., and Posch, T. (1999). Comparison of a direct live count and an improved quantitative protargol stain (QPS) in determining abundance and cell volumes of pelagic freshwater protozoa. Aquatic Microbial Ecology 18, 95-103. Posch, T., Simek, K., Vrba, J., Pernthaler, S., Nedoma, J., Sattler, B., Sonntag, B., and Psenner, R. (1999). Predator-induced changes of bacterial size-structure and productivity studied on an experimental microbial community. Aquatic Microbial Ecology 18, 235-246. Mayer, J., Dokulil, M.T., Salbrechter, M., Berger, M., Posch, T., Pfister, G., Kirschner, A.K.T., Velimirov, B., Steitz, A., and Ulbricht, T. (1997). Seasonal successions and trophic relations between phytoplankton, zooplankton, ciliate and bacteria in a hypertrophic shallow lake in Vienna, Austria. Hydrobiologia 342, 165-174. Pernthaler, J., Alfreider, A., Posch, T., Andreatta, S., and Psenner, R. (1997). In situ classification and image cytometry of pelagic bacteria from a high mountain lake (Gossenkollesee, Austria). Applied and Environmental Microbiology 63, 4778-4783. Pernthaler, J., Posch, T., Simek, K., Vrba, J., Amann, R., and Psenner, R. (1997). Contrasting bacterial strategies to coexist with a flagellate predator in an experimental microbial assemblage. Applied and Environmental Microbiology 63, 596-601. Posch, T., Pernthaler, J., Alfreider, A., and Psenner, R. (1997). Cell-specific respiratory activity of aquatic bacteria studied with the tetrazolium reduction method, cyto-clear slides, and image analysis. Applied and Environmental Microbiology 63, 867-873. Simek, K., Vrba, J., Pernthaler, J., Posch, T., Hartman, P., Nedoma, J., and Psenner, R. (1997). Morphological and compositional shifts in an experimental bacterial community influenced by protists with contrasting feeding modes. Applied and Environmental Microbiology 63, 587-595. Posch, T., and Arndt, H. (1996). Uptake of sub-micrometre- and micrometre-sized detrital particles by bacterivorous and omnivorous ciliates. Aquatic Microbial Ecology 10, 45-53.